Some may consider that civilian nuclear energy programs are going great guns and will grow in future. They will not. In fact, its slow death is already on and will only accelerate in future. Let’s understand why. The nuclear energy industry has had a charmed half century of existence. What essentially started as military research for the development of weapons of mass destruction (WMD) was subtly packaged into a benign energy source. At heart, the roots of nuclear energy are firmly linked to military use. The cold war was an occasion which offered the nuclear energy industry the use of massive funds, research facilities, government grants (subsidies) and huge freedom to conduct more and more research into making more and more weapons. Nuclear Energy was simply a byproduct of this military work. Companies and governments worked overtime to create a veil of secrecy around atomic energy so that the common person would not be able to link the two. And to their credit, they succeeded for a large part. In the days before the advent of the internet, information was scarce and expensive to procure. People – by and large – tended to believe what the ‘scientists’ and the governments told them. 1) Nuclear industry means ‘national security’ and ‘national pride.’ Any opposition to nuclear automatically makes you an anti-national. 2) Nuclear Energy has no alternative because of its “cleanliness” and ability to deliver large amounts of power at cheap cost. It is said that if a lie is told a thousand times, people start to believe that it is the truth. The tipping point for the nuclear industry came after the end of the cold war. Contrary to what most people believe, Chernobyl had no effect on the growth of the nuclear energy business. After a tiny blip, the industry was back to it’s own self. Anyway, concealment, fabrications, misrepresentation of facts, propaganda, censorship of news, strong arm tactics were all part of the overall cold war game. The world knew that a huge nuclear accident had happened in Russia. But beyond that, they had little more knowledge. The Russians painted a picture of “all-is-well“, while the West tried to malign Russian technology and safety. Neither really questioned nuclear energy as a whole. Sure, there were enough independent researchers who risked life and limb to bring out the truth. But it was easy for the governments of those days to tackle these civilian groups – after all, government agencies were trained to play the big spy games – a bunch of civilians was a cakewalk for the masters. The disguise continued unabated until the unexpected end of the cold war. The cold war meant that there was little need for military deterrence (?) The future wars would be fought on economic fronts and smart wars would take centre stage. Tactical weapons, quick surgical strikes on specific small strategic targets did not require the kind of arsenal needed during the cold war days. It was no longer fashionable to parade the missiles and warheads on National days and gloat about technological prowess. The new kind of weapons did not require as much of plutonium but needed a material that was far easier to procure – depleted uranium (DU). DU is easily and openly available from nuclear reactors without the need for complex and expensive reprocessing technologies. The guided missiles tipped with DU are hundreds of times more powerful compared to ordinary bombs and can cause massive damage to over and underground structures. Because of the fact that they do not leave a huge visible impact (like that of an Atomic Bomb), people do not realize that effectively, a nuclear weapon has been used. These missiles have been extensively used in the wars in Iraq and Afghanistan. While they have sometimes ensured that the targets are taken out, they are as deadly as a nuclear attack and leave behind vast amounts of radiation in the environment. People affected by DU develop the same conditions as those in Hiroshima or Nagasaki – the only difference being that of immediate visibility and localization. The US and NATO troops have got away by using these weapons of tactical attack for many years now and the effects are showing up in the local population there – increased cancer, deformities, mutations and all the other radiation induced diseases are seen here. The soil and ground water is polluted with uranium and will continue to do so for many decades to come. The radiation has spread wider and entered the food chain and will continue to irradiate for a long time to come. The West had found the ideal nuclear weapon which can be used easily – without any concern of accountability or justification needed for a full blown nuclear attack. The need to use nuclear energy and the spent fuel had diminished and the military had a far lesser interest in these reactors. Almost at the same time, another and more significant revolution was taking place. Almost out of nowhere, the computers, satellite television, instant messengers and the internet were all over the world. Nothing was hidden. Information previously restricted to libraries or locked away in forgotten cupboards was suddenly openly available. Information flow meant that there were no longer any holy cows. Discussions happened over emails and internet, ideas exchanged and previous paradigms challenged. When Data gets analyzed, it turns into Information. The massive amount of data which was scattered all over the globe earlier was put together and analyzed. Cheaper but more powerful computers allowed this massive data to be analyzed on desktop computers without the need for super computers. What emerged was the naked truth. Atomic and nuclear science is no more (or less) mysterious or complex than any other science. The sheer eliteness of being part of a select “nuclear club” was shown to be hollow. 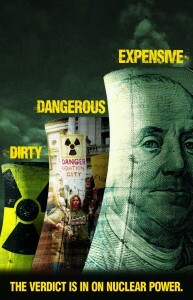 The cost of nuclear energy in purely financial terms was proven to be the highest, the enormous social damage, the horrible medical conditions and the silent environmental destruction were proven – with irrefutable data. Troubles, they say, come in multiples. With no place to hide, the nuclear industry was hit by developments in renewable energies which took off at a massive scale resulting in prices crashing beyond imagination. A new, safe and cost effective option arose for which the nuclear industry was totally unprepared – literally caught with its pants down! With no business model to survive, shrinking patronage from the defence and government ministries, Fukushima was the final nail in the coffin. In plain, open view, the incident shamed the industry badly and showed the world that the civilian nuclear operators were leagues ahead of Big Oil and Tobacco when it came to blatant lies and endangering lives for maximizing own profits. Safety and ethics be damned. In the end, the nuclear industry has only itself to be blamed for its decimation. Nobody – except probably its own nuclear village fraternity – will shed any tears on its death. It is one death which does not merit a RIP.